Changing your health habits is kind of a big deal. It takes time and focus. It can also produce benefits that can change your life. If you have a good plan, you can be more efficient and you can increase your likelihood of success. 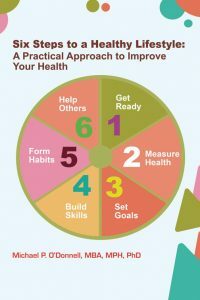 This book provides a framework for that plan and has six steps: Get Ready, Measure Your Health, Set Goals, Build Skills, Form Habits and Help Others. Most people think of health as something much broader than physical health, and a growing number of physicians and scientists have begun to study this expanded perspective. The American Journal of Health Promotion, one of the leading research journals in the field, defines optimal health as “a dynamic balance of physical, emotional, social, spiritual and intellectual health.” Six Steps to a Healthy Lifestyle will help you assess your current health, give you the tools to help you identify what you want to change and the framework for a practical plan to be successful. Based on proven science, the content is presented in an easy-to-follow, engaging style, including real-life examples from the author’s personal experience. You will learn about the relationship between your lifestyle and your health and be empowered and motivated to begin your personal journey today. Improving your lifestyle, especially if you focus on what is most important to you, will improve the quality of your life and your personal sense of wellbeing in ways you have never imagined.